Russian military jets were scrambled to head off an ‘aggressive’ US warship along the edge of their territorial waters of the Black Sea. Ever since Russia’s annexation of the Crimea peninsula, she has been pursuing to ensure the integrity and security of the territory. The crisis in Ukraine has raised Russia’s sensitivity to any infringement on her territorial waters. The western powers including the United States seem to think its business as usual with their announcements of military manoeuvres along Russian borders and territories. The Russians see these historic moves as a ‘stability threat’ nowadays and could be forced to respond in a harsh way that could provoke a retaliatory aggressive response from the other party. Before you know it the situation could escalate into an unknown type of world warfare the likes of which has never been written in any history book, or produced by Hollywood or Ealing Studios. The world is awash with nuclear bombs and no one is in charge to do something about them. The smallest miscalculation by either side, or a deliberate opportunistic calculation by one party could turn into war. 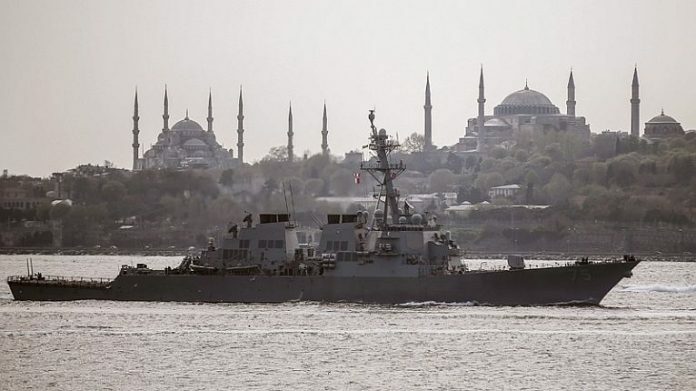 Russian news claims that Russian armed forces in the Crimea have spotted the US guided missile destroyer USS Ross moving along the edge of its territorial waters and towards them. The US Pentagon says the USS Ross is acting within international law and the routine operation has been publicly announced. It vehemently denies any unusual behaviour or President Putin’s claims of USS Ross acting ‘agressively’. A Russian source told state news agency RIA: “”The crew of the ship acted provocatively and aggressively, which concerned the operators of monitoring stations and ships of the Black Sea Fleet,” RIA quoted the source as saying. “The U.S. Navy operates routinely in the Black Sea, in accordance with international law,” Lainez said, noting the Ross’s deployment to the Black Sea had been publicly announced. The United States said last month that it was filing a complaint to Russia over a Russian fighter’s “sloppy” and unsafe interception of a U.S. reconnaissance plane in international aerospace over the Baltic Sea. Is Greece About To Enter Into A Civil War?